Total moisture removal (TMR™) products produce very high quality dry air or nitrogen (N2) from a normal compressed air source. The air or N2 is passed across the lubricant surface and vented out the breather element. 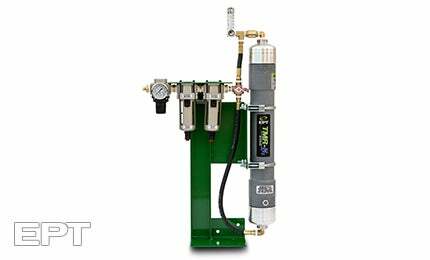 TMR systems remove water and TMR N2 systems remove water, oxygen, hydrogen, carbon monoxide and other waste gases that frequently accumulate in hydraulic fluids. TMR systems remove all water regardless of its form and are ideally suited in free breathing reservoirs that are not under vacuum. These systems are extremely effective and normally generate immediate payback.